Kaaboo Del Mar has officially announced the lineup of its 2019 festival. On Thursday morning, Kaaboo Del Mar -- San Diego's largest music and entertainment festival -- officially dropped the lineup of its upcoming Sept. 13-15 event, and it features Kings of Leon, Dave Matthews Band and Mumford & Sons as main headliners. This year's annual festival, which is held at the Del Mar Fairgrounds, is Kaaboo's fifth. It kicked off in 2015 and has always billed itself as "everything a typical music festival is not." Described as "an adult escape," Kaaboo's amenities and attractions, aside from tons of music and comedy, include artisinal cuisine, craft libations and beers, spa services, contemporary visual art, Vegas-style pool, cabanas, dance clubs, plenty of seating, and its pleasantly surprising claim to fame, luxury bathrooms. Various weekend pass ticketing options, starting at $259 (plus fees), are currently available for purchase at kaaboodelmar.com. As always, the Kaaboo lineup seems to offer something for everyone: There are several artists that appeal to a slightly more seasoned demographic like Squeeze, REO Speedwagon, the Bangles, Little Steven & the Disciples of Soul, Edie Brickell & the New Bohemians and Duran Duran; a few acts that might be new to some such as Maren Morris, Keuning, Cheat Codes, Con Brio and Andrew McMahon in the Wilderness; and big names all around like the Cult, Black Eyed Peas, Sheryl Crow, Snoop Dogg, Wu-Tang Clan, Sublime With Rome, OneRepublic and Mark Ronson, among many others. Over the past four years, the fest has featured huge music acts like Foo Fighters, Muse, Robert Plant, Post Malone, Tom Petty & the Heartbreakers (sadly, one of Petty's last performances before his untimely passing), P!nk, Red Hot Chili Peppers, Ice Cube, Aerosmith, the Killers and many, many more. It's expected to draw more than 100,000 people over the upcoming mid-September weekend. 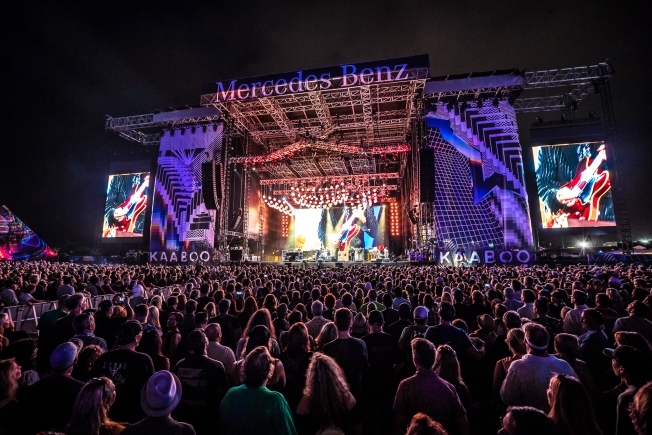 The multi-day event has grown so popular (it reportedly sold out last year), organizers have branched out with the brand -- producing a Kaaboo Festival on May 10-12 in Arlington, Texas with the Killers, Kid Rock, Sting and more; as well as a Kaaboo Cayman Islands that took place last month on Feb. 15-16 with Duran Duran, Blondie, Zedd and others.